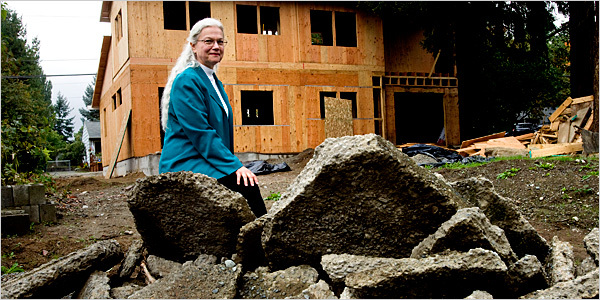 TITANIA INGLIS / NEWS: Paper, plastic, and... houses? I'll never cease to be shocked by the huge piles of garbage New Yorkers leave on their curbs for the sanitation department, and I'm continually horrified by the enormous debris-filled dumpsters that seem to mark every construction site. But not all construction has to be so wasteful: even houses, it turns out, are recyclable. Like many sustainable practices, this isn't some new trend. Reusing building materials dates back to the preindustrial period, when some of those missing chunks from the Coliseum were used to build St. Peter's Basilica, according to a NY Times report. These days, some 245,000 houses are demolished each year in the United States alone, generating nearly 20 million tons of debris. And that doesn't even begin to account for renovations, the main source of debris in my Brooklyn neighborhood. The good news? Up to 85 percent of your average house can be reused. In New Orleans, where for obvious reasons an awful lot of houses are being revamped or torn down, The Green Project has jumped on the salvage bandwagon. Dedicated to keeping "waste" out of landfills, the nonprofit helps to carefully deconstruct buildings so their component parts can be reused, and has opened a salvage yard and recycling center. They even collect leftover paint, which is great for a multicolored look... and for anyone who's pledged The Compact but wants to redecorate. Back in the Bay Area, Urban Ore in Berkeley is a treasure trove of architectural bits and pieces as well as electronics parts, old science lab equipment, and other people's family photo albums. The rambling warehouse anchors a whole neighborhood of salvage yards including the pricier Omega Salvage, craft-supply source the Center for Creative Reuse, and plenty of unnamed junkyards with great bargains for the persistent rummager. Too bad New York, with all its garbage, seems to have a shortage of architectural salvage yards; the only one I've managed to dig up is Build it Green in Queens, inconveniently located far from any subway line, and therefore not reviewed for this post.